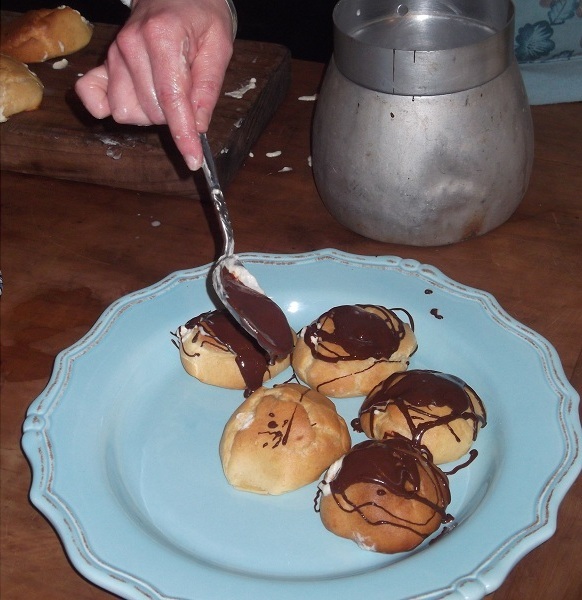 The recipe for these Choux (said ‘shoe’) Puffs came from the NZ House and Garden Magazine (January 2011 issue). I find there are some great recipes in this magazine that are often a bit different but still simple and with ingredients most kitchens have (or at least know what they are!). Zak wanted me to make something that you might not think is possible to make in a wood stove and these turned out perfectly – light, hollow and crisp on the outside while soft in the centre! Use them to make cream puffs, profiteroles or eclairs. Makes 25. 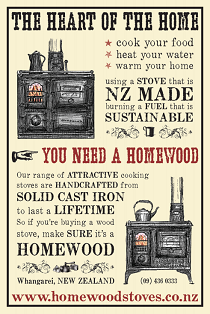 Preheat your oven to 190 C fan bake (or if using a Homewood oven get it up to around 200 C). Bring butter and water to the boil in a medium saucepan. 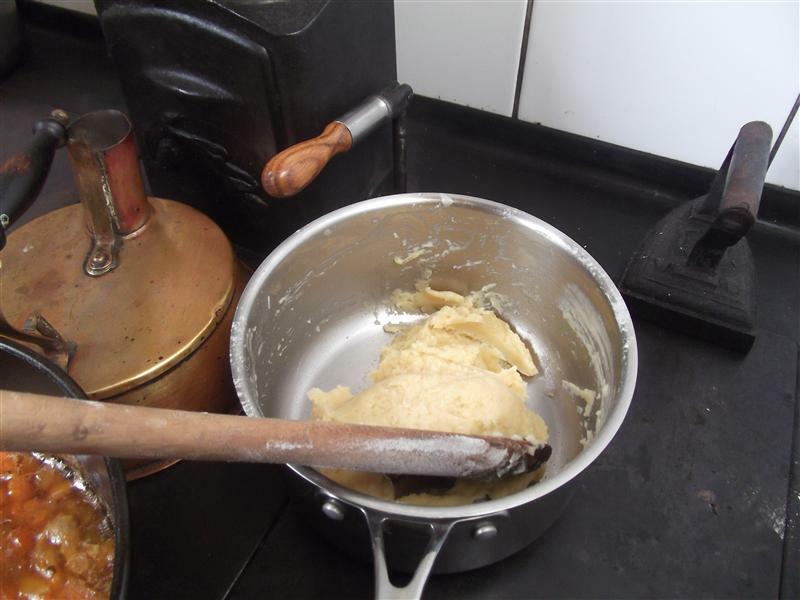 Take off the heat and add sifted flour all at once and quickly beat in with a wooden spoon. Return pan to a gentle heat and stir mixture briefly until it stops sticking to the sides of the pan. Cool for 10 minutes. Beat eggs in a jug until foamy. Place dough mixture in a food processor and with motor on slow speed gradually pour in the eggs. Process until thick and glossy. Sprinkle lined baking trays with a little water (this creates steam which helps the puffs to rise) and pipe or spoon 5 cm rounds on trays leaving enough room for them to double in size. Use a wet finger to smooth tops. Bake for 15-20 minutes (and don’t be worried if they take awhile before puffing up) and then reduce oven temperature to 165 C and cook for a further 10 minutes or until golden and puffed – to do this when using a Homewood either move the tray into the lower oven (which runs at 3/4 the temperature of the top oven) or just leave the top oven door open until the temperature has dropped. 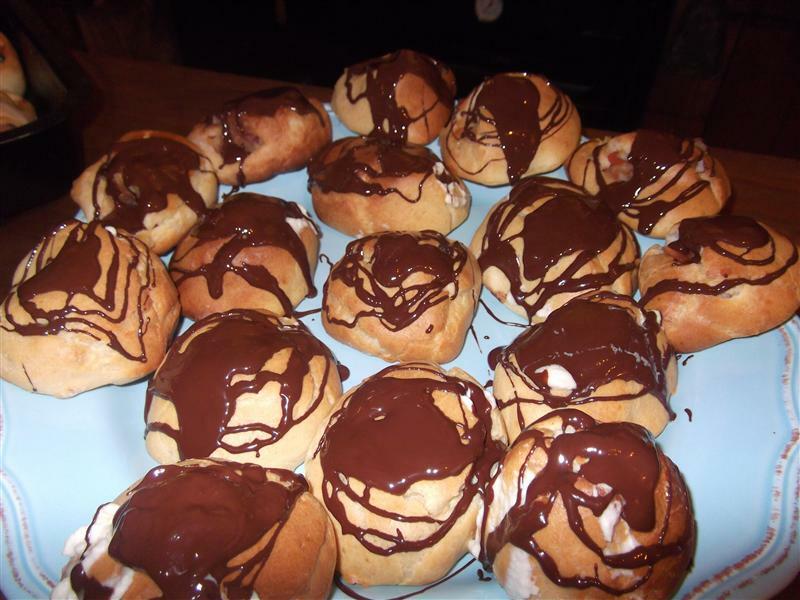 Puffs are cooked when they are well risen, golden brown and feel hollow – if not fully done they will collapse. Take from oven and pierce a small hole in the bottom of each puff using a skewer to let steam escape (keeping them crisp) and place on a drying rack upside down. 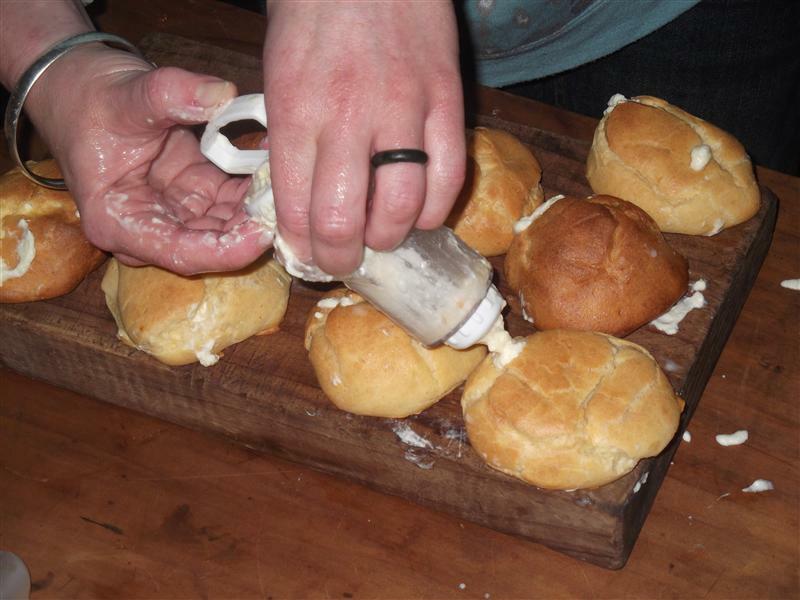 Cool before filling – they can be filled up to 2 hours before serving. Fill with sweetened whipped cream (add sugar while whipping to taste), custard mixed with thickened cream, ice cream and mashed up fruit salad… and dipped in chocolate (equal parts melted chocolate and cream) or sprinkled over with icing sugar. Best eaten the day they are made or frozen, thawed and refreshed in the oven before filling.